Is Tori Spelling Having a Nervous Breakdown? 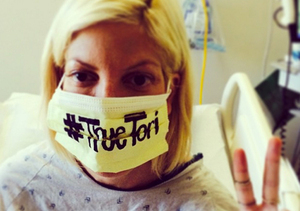 Hospitalized reality TV star Tori Spelling could be suffering from a nervous breakdown. Insiders told TMZ that Tori is faking her “Ebola scare” and checked herself into the hospital to cover up the fact her “marriage is on the rocks,” and her fears that husband Dean McDermott may be drinking again, and that she's making herself sick. Sources also said Spelling’s financial issues are taking a toll. In a cryptic Instagram post from her hospital bed, the 41-year-old appeared to call out McDermott by suggesting that he was not supporting her while she was sick and hospitalized.